Almost two months ago, I met God. Rather, I received an epiphany – God’s revelation through a migrant man. Let me call him Miguel. I met Miguel at a homeless shelter in Tijuana, Mexico, a day after he was deported. He entered the US twenty-two years ago by walking along the San Diego beach and simply crossed the border. He found honest living as car mechanic, eventually owning a body shop and providing for his wife and two beautiful daughters. One day, he was accosted by the police and was immediately deported for not having immigration papers. He told me of his plans to reenter the country as soon as he could. I asked if he understood the great risk of being caught and branded a criminal, never to have any chance of entering the US again. He looked at me, with tears swelling up his reddened eyes, and said: “I have to do it. I want to be with my family. They are my home.” Looking at his teary eyes, I encountered God. It struck me that God embraces a similar risk to be with you and me, willing to pay the cost to be with those whom God loves. Today we celebrate the love of a God who humbly became human like us. Jesus, Word of God, Who is God, became one of us. He built his house next to ours, lived among us, ate like us, suffered with us, for us, to save us. He came as a child, a poor child, born in a humble manger. To a poor family. To serve and give his life because he loves us. He wants to make us God’s home, God’s favorite hiding place. God is crazy in love with us. Like people who love, God wants to be one with us whom He loves. 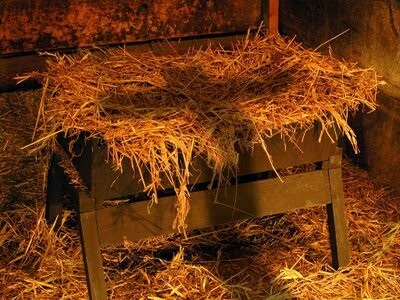 Today, we celebrate a love born in the crib and continue to the cross. In Miguel, God reveals to me a love willing to accept all costs to be with the beloved. When we look at a person who is poor (or migrant), who loves, who forgives, we see God. God who is poor, who loves, who forgives. God chooses to show God’s light most clearly through human beings, through you and me. Through us who are poor, weak, and sinful. This is the glory of God’s humility. The light of God’s love. What if God wants to surprise us in humble and unexpected ways, revealing Godself in the least of those we interact during these festive days? What if God desires to encounter us in our poverty and humility?